Inspiration for nail art have been elusive for some time now. And experiencing copyright infringement over and over is not much of an help. I'm making a stand. But, that's a different story to tell. For now, let me share with you a rather awesome experience at an awesome hotel during an awesome mini-vacation with awesome blogger friends. Okay, so last month some friends and I decided to explore a few cities/provinces in Bicol Region (Philippines) for a few days. It was to take some time off and enjoy each other's company. We rendezvoused at Legazpi City, Albay and we were privileged to experience first class accommodation by The Oriental Legazpi. The hotel's architecture consists mainly of glass panels that actually gave the hotel a classy flair. The design allows natural sunlight to come in making lighting very economical. It also maximizes the enjoyment of viewing the landscape surrounding the hotel. And guests would definitely love to take advantage of this because the view from The Oriental Legazpi includes the Mayon Volcano that is well renowned for its perfect cone. 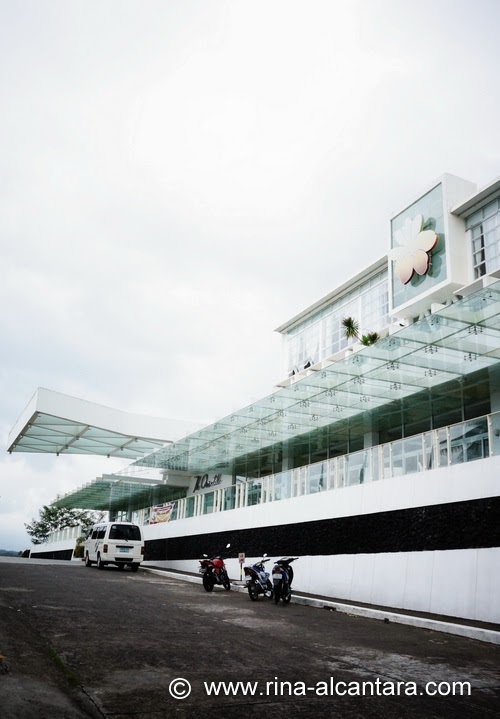 It is actually the only luxury hotel in Legazpi City that offers a complete view of the volcano from foot to foot. This is enough (in my book) to make our stay worthwhile. We were ushered to our respective rooms after enjoying a refreshing welcoming drink when we arrived. We were given the Deluxe Mayon Room and your guess is as good as mine. It has a very good view of the Mount Mayon in the veranda. Amazing, right? Too bad it was really cloudy during our stay and this national landmark barely peeped for us. Clean white sheets complements the overall look of the hotel. No need for fancy bedsheets. Simplicity made this hotel really classy. Oh, and I must say that the pillows were really comfortable. Perhaps they were memory pillows, I couldn't tell the difference. A working desk, coffee table, and cable TV is located across the bed. The desk is situated beside the veranda where guests can take advantage of the view and natural light. It also has its own lamp just in case you need to work in the evening. I commend hotels that includes table lamps in their room amenities. It's an important detail that most hotels overlook. Notice that the design of the furniture where also kept at a minimum. A bouquet of "sili" (red pepper) rests in the coffee table to add color to the room. It was a creative way of showcasing what the province is well-known for. As an artist, details are quite important to me. And The Oriental Legazpi did not disappoint! Aside from the desk lamp, there is also a little emergency lamp that is plugged into one of the wall outlets just in case there's a power interruption. No need to worry if you have a flashlight with you or stumble as you make your way around the room when a blackout happens. There's a built-in closet with robes, slippers, and hangers. The room also includes an electronic safe to secure your valuables. A mini bar and a personal refrigerator can also be found in all rooms. The hotel also has complimentary Wi-Fi. For bloggers like myself, this is highly important. And now, to what I usually check first -- the bathroom! 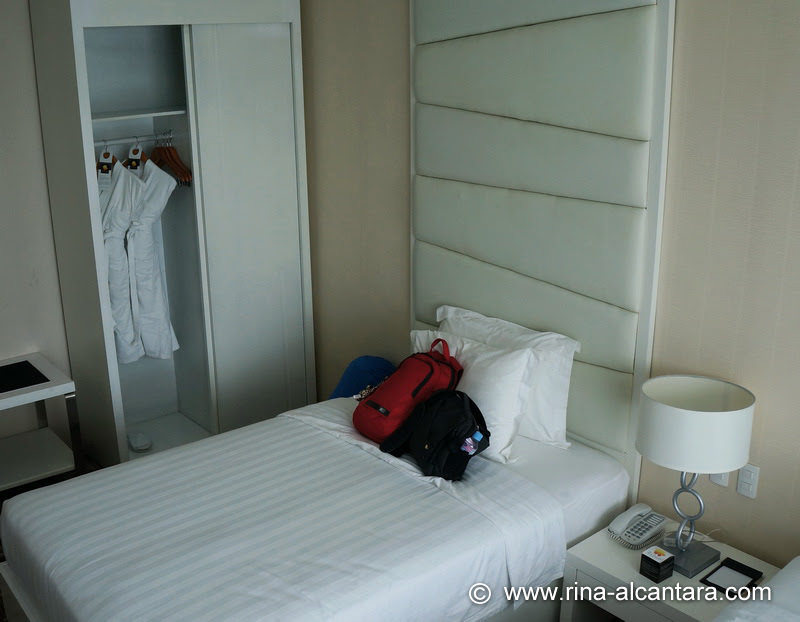 The Oriental Legazpi boasts of having a rain shower in their rooms. Yes! I love taking a shower with this baby. 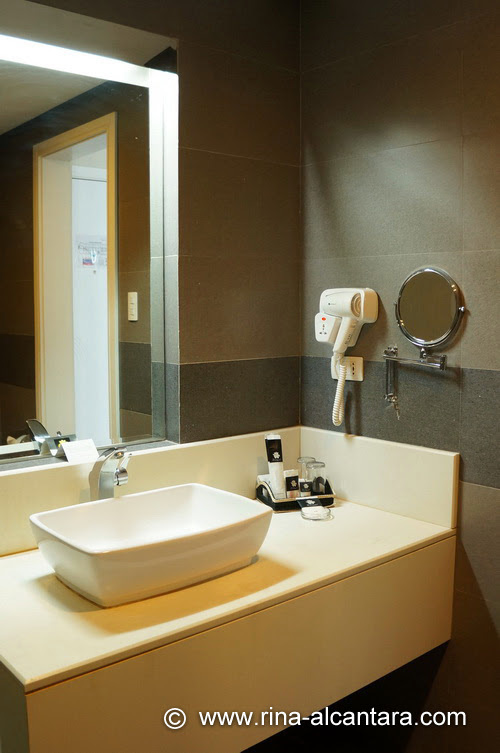 There's room for personal toiletries on the side and a soap holder beside the shower switch. There is also a clothes line if in case you take a dip in the hotel's infinity pool on the second floor and need to dry your swimwear. 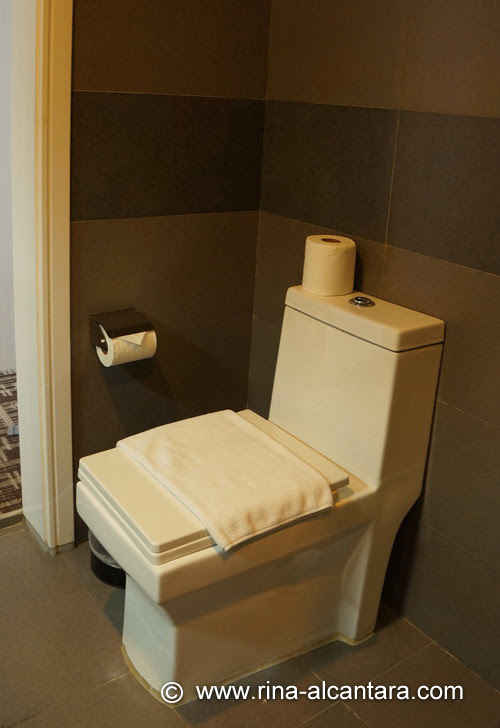 The toilet seat is surprisingly square-y. I rarely see such design. But as long as it is clean and properly working, I am definitely not complaining. The only downside I saw is that the bathroom didn't have a toilet bidet. I think it should be a staple in hotels such as The Oriental. There's a life size mirror right outside the bathroom sliding door. I appreciated that, too. If you prefer having a bathtub, go for the executive rooms and the governor's suite for total relaxation. The suite includes a receiving area, a small kitchen, dining and living area. Bottomline, one will get the same comfort regardless of which room you are staying. The only difference is the view. One side of the hotel offers a good view of the vast flora of the province. Such rooms is less expensive. 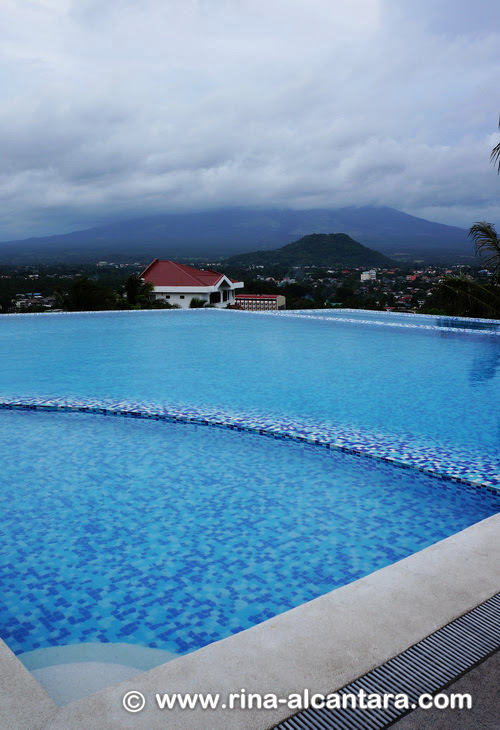 Not to fret, you can always go down the infinity pool to sit back, relax, and enjoy the view of Mount Mayon. Personal tip: Rooms situated at opposite ends of each floor are most spacious compared to all the other rooms for the same room type price. The pool area is a good place to relax. The view is breathtaking. Well, in most days it is. As you can see at my photo, Mt. Mayon seems like the shyest active volcano. It is also unfortunate that a newly built house has become an eyesore. Towels and lounge chairs are available to guests. The infinity pool opens from 6:00am to 8:00pm. Overnight accommodations are inclusive of a buffet breakfast for two (2) which you can enjoy at the Jasmine Restaurant. 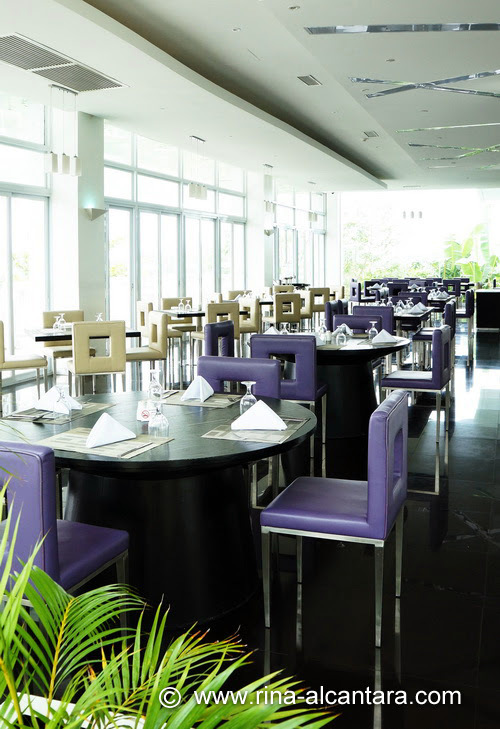 The restaurant has a large floor area and has more than enough tables to entertain guests. The food are properly sectioned so you don't have to worry about lines. And if you more of an outdoor person, the hotel's frontage has a porch where you can have your hearty meals. Tables are conveniently apart to give some privacy. Perfect for morning meetings or chats without the worry of hassling other guests eating at adjacent tables. And if you think there isn't anything to do in the evening, think again! Perhaps a visit to The Spa will help you get a good night rest! we got to experience this too! 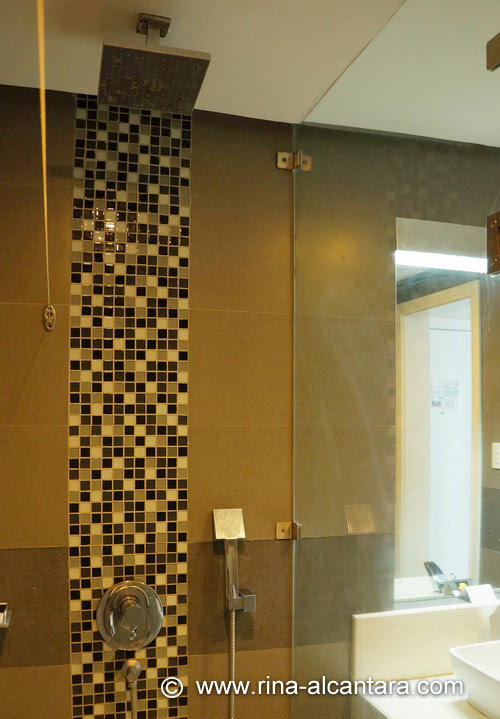 The Spa is at the hotel's basement and is open from 10:00am to 12:00 midnight. 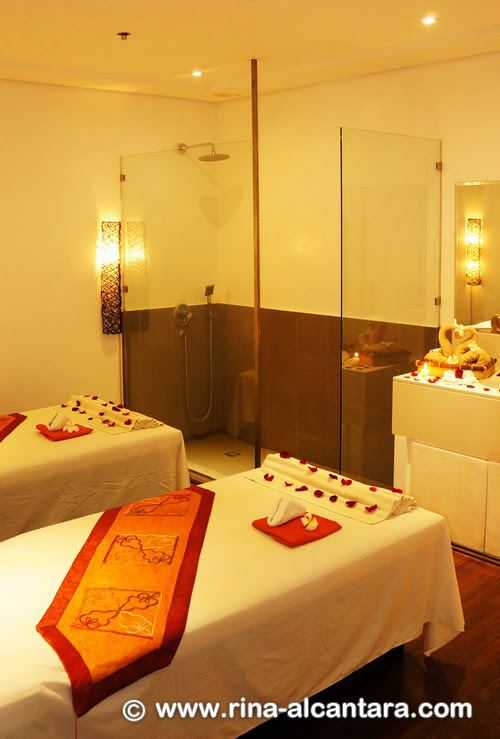 Individual rooms provides total privacy during your massage. They offer various spa packages and a body scrub service too! Oh, and they offer nail art as well! It was something I wanted to try. But perhaps on my next visit. A couple's rooms is available for ... you know, couples. It has its own shower area and a mini jacuzzi. If you are too tired to make it to the basement, you have the option to have your massage in the convenience of your room for an extra charge. There is a gym right across The Spa for those who don't want to miss their routines. This was the freehand nail art design I did for our Bicol getaway. I called it Crazy Lines Nail Art. I needed something festive and colorful as we were attending a festival in the area. I had a wonderful stay at The Oriental Legazpi and would definitely want to be there the next time I visit Bicol. Thank you very much for the warm welcome and for the very helpful staff for making this nail artist's vacation another memorable one.